Alive 90.5’s award-winning Sunday Sports Round-Up program is celebrating its 10th anniversary with a special event at the station in Sydney’s Baulkham Hills. On Sunday, 10 February from 12pm, everyone is invited to a BBQ, station tour and live outside broadcast. The three-hour show will be a tribute to presenters past and present, as well as an ‘originals’ panel featuring presenters who were on the first ever show on 4 February 2009. Everyone is invited to attend. It will be a great opportunity for the Baulkham Hills and surrounding communities to come together to celebrate their local sports teams. There will fundraising activities with all money raised contributing to the purchase of new headsets and outside broadcast equipment for the station. 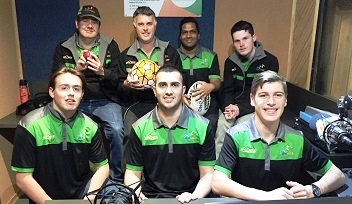 Sunday Sports Round-Up has been broadcasting home games of local rugby league team the Wentworthville Magpies for eight years, as well as local state soccer teams Blacktown City, Hilly United and Parramatta FC for five years. In 2018, the station and program won the CBAA’s Troy Garner Excellence in Sports Programming award. Tony Salerno, Executive Producer of Sunday Sports Round-Up (pictured top left) attended the Gala Dinner Awards night and accepted the award on behalf of the station. Please join the CBAA in congratulating Alive 90.5 FM and the Sunday Sports Round-Up team in celebrating the programs 10 years of sports passion. For more information, contact Tony Salerno.